Hello and welcome to the 55th installment of the SWD. SAA‘s 54th regiment reportedly fired at US reconnaissance aircraft/drone with anti-aircraft weapons over Qamishli in Northeastern Syria. Due to AA fire reconnaissance unit was forced to retreat. This move is no doubt SAA‘s response to US missile strikes on Al-Shayrat Airbase, Homs governorate. SAA has in the past downed MQ-1 Predator reconnaissance drone belonging to the US over Latakia in March of 2015. 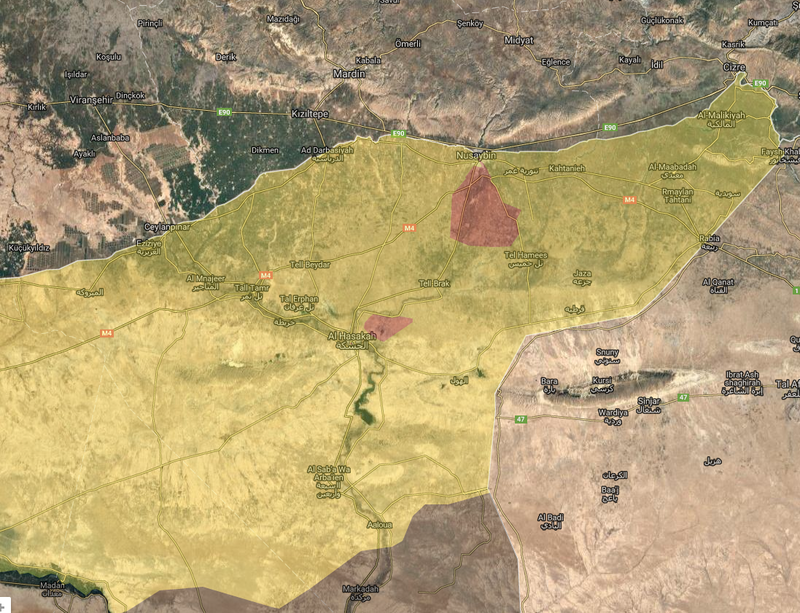 General situation in Hasakah governorate, Qamishli is directly south of Nusaybin on the map. Source: Interactive Rurikmap which can be found here. Fourth batch of rebels and civilians left Al-Waer district, Homs city towards TFSA-held territory, end goal of this journey is Jarablus. Last fifth batch of evacuees are supposed to leave the neighborhood in the next few days according to the chief of police in Homs. Rebels advanced in Al-Manashiyah district, Daraa against SAA capturing a dozen of buildings and a couple of checkpoints. 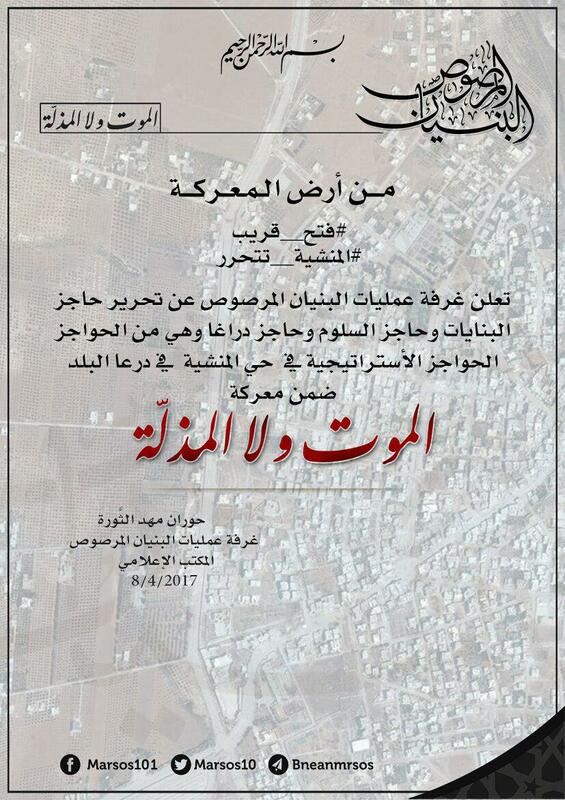 Earlier in the day Labeen and Syriatel checkpoints were announced as captured and then later Banayat, Salloum and Daghara checkpoints, the latter three being reported in a statement by Al-Bunyan al-Marsous operation room. SAA & allies allegedly retreated to the northern edges of Al-Manashiyah district meaning that rebels are almost in full control of district. However, several pro-government sources claimed that today’s attacks by rebels have been repelled, despite that they reported that rebels did advance in Al-Manashiyah but nothing significant was captured according to them. It was a quiet day in Iraq most likely because Iraqi Army is preparing for a new push in west Mosul and towards Tal Afar. National Security Service cracked an IS sleeper cell in liberated east Mosul, IS literature and several weapons were seized in the raid. Following yesterday’s suspension of Russia-CJTF-OIR agreement on flight safety, Belgium has announced that they are stopping military participation in CJTF-OIR‘s missions over Syria until further notice. Belgium will retain this stance until new deal with Russia is agreed or the old one is re-established again. Belgium will continue to strike IS-held areas in Iraq as a part of CJTF-OIR from Al-Azraq Airbase in eastern Jordan. More info is available on Deredactie.be. On the 7th of April 2017 CJTF-OIR has conducted 14 strikes in Syria. CJTF-OIR‘s main focus in Syria at the moment is Tabqa-Raqqa region where they did 13 strikes supporting SDF‘s operation against IS destroying seven fighting positions, a tactical vehicle, an IS wellhead and a vehicle-borne bomb; and suppressed two ISIS tactical units. Other area where one strike occurred is Abu Kamal destroying an IS wellhead. Full report on CJTF-OIR strikes conducted in both Syria & Iraq can be found here.